STEELE Sidebottom headlines four player re-signings at Collingwood, with the premiership midfielder agreeing to a new five-year deal while Taylor Adams and Jack Crisp have re-signed for three years and Adam Oxley for two. AFL.com.au reported last month that the Magpies had offered Sidebottom a five-year deal, and the club confirmed on Thursday that the deal had been finalised. The contract is understood to be worth around $3 million over the five years. Sidebottom, 25, was set to become a restricted free agent at the end of this season, but is now tied to the Holden Centre until the end of 2021. Adams, Crisp and Oxley were set to come out of contract at the end of this season, with Adams and Crisp now committed to Collingwood until the end of 2019 and Oxley until the end of 2018. 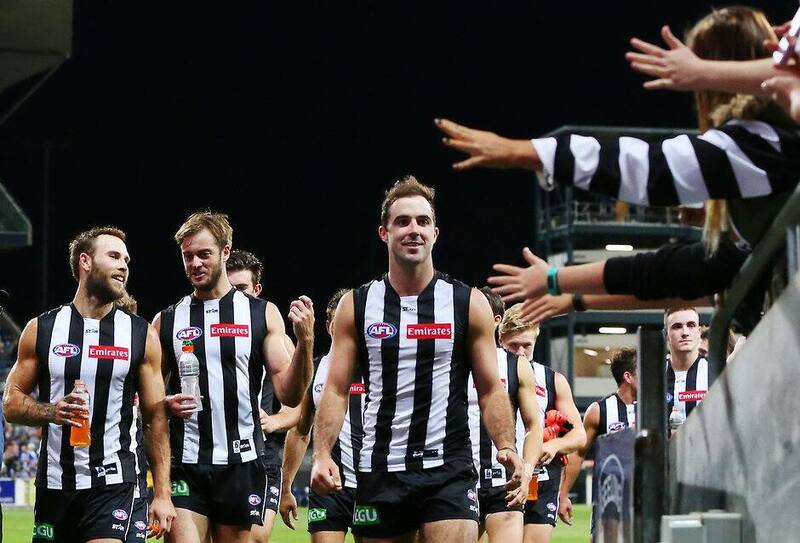 Sidebottom told Collingwood's website that the lure of playing in another premiership with the Magpies had been a big factor in his decision to stay. "I think having tasted [premiership success in 2010] I want to get that back and that's definitely a driving factor for me," he said. "Being in the leadership group now as well, it's my responsibility to help drive others to get to that place again, and I'm pretty confident with the list we've got that within the next couple of years it's definitely achievable." Adams and Crisp have been two of Collingwood's recent trade success stories. Adams joined the Magpies at the end of 2013 in the trade that sent premiership defender Heath Shaw to Greater Western Sydney. The former Geelong Falcon played 31 games in two seasons with GWS after being taken with pick No.13 in the expansion club's inaugural draft in 2011. After an up-and-down first season with Collingwood, Adams blossomed last year following the departures of fellow inside midfielders Dayne Beams and Luke Ball, finishing fourth in the club's best and fairest award despite missing four games. Adams' growing standing at the Holden Centre was underlined when he was elected to the Pies' 2016 leadership group. Crisp joined Collingwood as part of the Beams trade to the Brisbane Lions at the end of 2014. Initially seen as a bit player in that deal given he had played just 18 games in three seasons at the Gabba, Crisp was a revelation with the Magpies last year. One of only four Pies to play every game in 2015, he finished third in the club's best and fairest after developing into a disciplined run-with player capable of winning his own ball. Oxley was recruited from Queensland NEAFL club Redland in the 2013 rookie draft. The 193cm defender played just two games in his first two seasons at Collingwood, when he was plagued by injury. However, Oxley was a revelation in the Magpies' backline last season after earning selection in round one against the Brisbane Lions. Playing 17 games for the year – including the first 16 straight – he finished fourth at Collingwood for rebound 50s (42) and bounces (nine), and eighth in average possessions (18.5).